Uwe Haberkorn realized early on that the discovery had what it took to be a great success. “We were testing a new agent that would make it easier to detect prostate cancer,” recalls the medical director of the Department of Nuclear Medicine at the German Cancer Research Center (DKFZ) in Heidelberg, “and suddenly the radiation therapists and urologists were telling me that they wanted to work exclusively with this new agent for diagnostics.” The images of the cancer cells on their screens were much sharper and clearer than with any of the previous methods. This happened just seven years ago. Since then, several hundred thousand patients around the world have benefited from the Heidelberg invention. 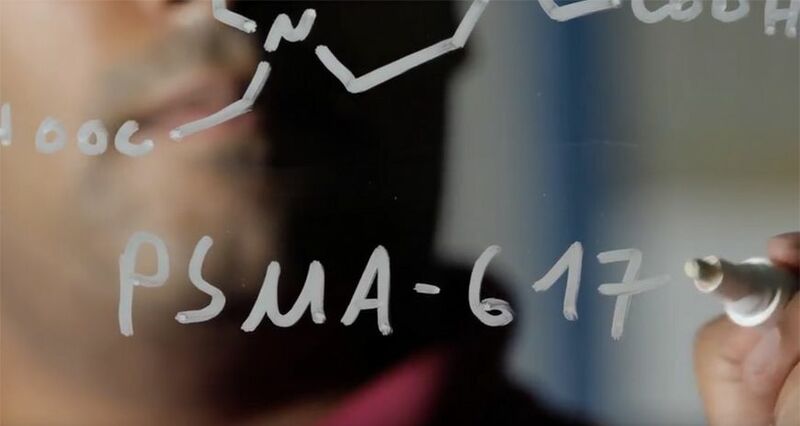 The starting point of the discovery was PSMA. This is a prostate-specific membrane antigen present on the surface of healthy prostate cells, which is found at much higher levels on prostate cancer cells. The protein is found hardly anywhere else in the body. An interdisciplinary team of researchers from Heidelberg took advantage of this situation and developed a small molecule that binds to this antigen and can also be labeled with various low-level radioactive substances known as radionuclides. Once the researchers inject the molecule into the patient’s bloodstream, it remains attached to the prostate cancer cells. The radioactive part of the molecule ensures that the accumulations of the molecule in the cancer cells are visible. During a positron emission tomography (PET) scan, these labels allow doctors to identify even the smallest clusters of prostate cancer cells. In addition to nuclear physician Uwe Haberkorn, the research team includes two chemists and a biotechnologist. “It was precisely this combination of different disciplines that made our work possible and ensured the breakthrough in this short time,” says Klaus Kopka. The head of the Radiopharmaceutical Chemistry department at DKFZ speaks of an “inventor community” behind the project. In addition to Kopka and Haberkorn, the group also includes chemist Michael Eisenhut (DKFZ, emeritus) and biotechnologist Matthias Eder (University Hospital Freiburg, DKTK and DKFZ). The four researchers from Heidelberg were awarded the Erwin Schrödinger Prize for their discoveries at a ceremony during the Helmholtz Annual Meeting on September 11th. This prize is awarded every year in alternation by the Stifterverband and Helmholtz and recognizes innovative achievements at the interface between various disciplines in medicine, the natural sciences, and engineering. Doctors all over the world have been able to give their patients new hope using this development, which began as colleagues playing around with ideas in Heidelberg. Uwe Haberkorn humbly comments on this success. “Of course you're happy when something you've developed works,” he says. An interdisciplinary research award presented by the Hermann von Helmholtz Association of German Research Centres. The Stifterverband Science Award – Erwin Schrödinger Prize recognises outstanding scientific achievements and technological innovations at the interface between various disciplines in medicine, the natural sciences and engineering. The work must involve representatives of at least two disciplines.